By Sylvain Richer de Forges, Head of Sustainability at Siloso Beach Resort. The role of the private sector is crucial in driving a much needed “green revolution”. The response time of governments around the world at dealing with global environmental issues is slow, and they struggle to implement even basic changes. Businesses are in a far better position. In fact, they are the only hope of driving real change quickly. If we wait for governments to react it will be too late. This is the story of one business that took a simple corporate social responsibility (CSR) project and turned it into a national scale programme that reverberates across national boundaries and multiple sectors. The portal was conceptualized and developed based on a book (written by the author of this article): “The Biodiversity of Life on Earth: from Heritage to Extinction”. 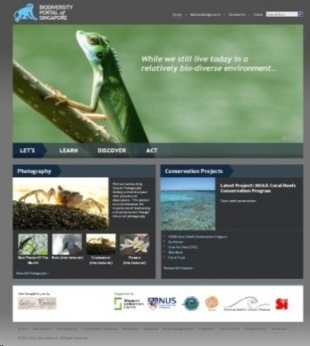 More than merely a unique educational platform on biodiversity, the website was specifically designed to serve as a hub for individuals and organisations willing to learn and act on the subject both locally and internationally. Biodiversity loss has been identified as one of the four main important challenges that mankind must face during the 21st century, along with access to clean water, poverty and climate change. In a world where environmental issues are reaching a critical point that requires immediate action on a global scale, there is need for a new wave of educational and action initiatives. Indeed, too often the key message still does not seem to reach the public. SBR has taken this message to heart: its CSR efforts extend far beyond the portal. The resort has redefined the concepts of sustainability and environmental preservation from the beginning. As the first TUV Rheinland Eco-certified hotel in Southeast Asia, the hotel served as the model for the development of Singapore’s SEC Eco-Hotel Certification Scheme and was the winner of the Singapore Environmental Achievement Award (SEAA) 2010/2011. Their environmentally sustainable business model spans all aspects of managing the Eco-Resort and provides ambitious conservation targets. The facility serves as a test-bed of new environmentally friendly technologies as well as a showcase of best sustainable practices. One of the fundamental principles of SBR is to maintain harmony with nature and protect biodiversity. 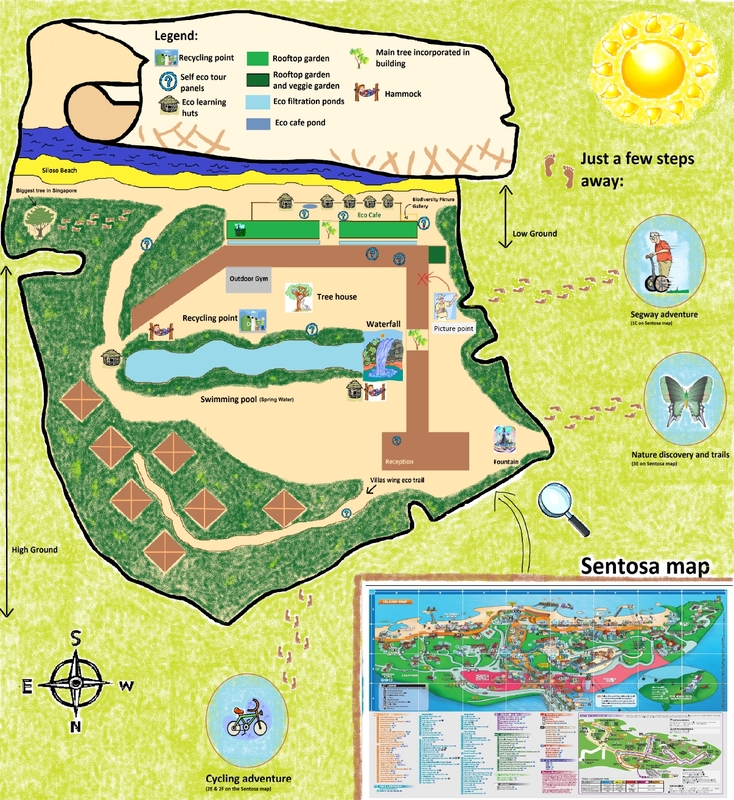 It does this by developing land with minimum disruption to the existing terrain and facilitating the growth of over 600 trees native to Sentosa Island. Throughout the resort, trees are literally incorporated within the infrastructure. The extensive tree cover, coupled with numerous energy saving technologies and one of Singapore’s largest surface areas of insulating rooftop garden (picture below), dramatically reduces the resort’s energy needs. This same innovative approach to sustainability is applied to water use and to the restaurant’s food sourcing. Throughout the restaurant, a unique photography gallery showcasing numerous pictures of wildlife, taken both within the resort and externally, intends to showcase biodiversity and to stir an interest in conservation. In addition, SBR conducts regular onsite Eco Tours to various stakeholder groups and guests to share the message of sustainability. The resort feels that its achievements and commitments to preserve the environment should not be limited to within the resort. For this reason the resort has a strong CSR programme that regularly contributes to meaningful initiatives. I would encourage many other businesses to take the same path and challenge both themselves and society. We must keep in mind that extinction of species is dramatic, forever and irreversible!